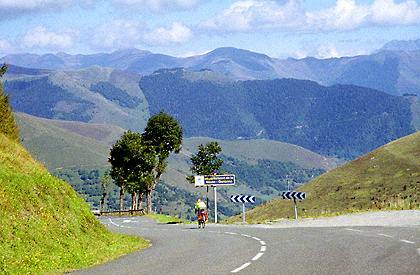 The Tour de France has crossed Pyrenean passes east of here. But none of those have been crossed nearly as often as this one. Partly this is due to the geography of roads. 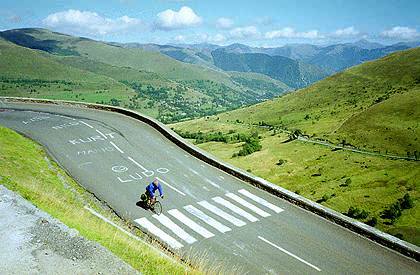 To get from the more easterly Pyrenees to the Central Pyrenees with its high passes Col du Tourmalet and Col d'Aubisque, you have to cross this pass. Its numerous Tour de France appearances are partly a geographical necessity. From a scenic standpoint - what stands out in my mind about this pass are the sweeping grass hills near the summit on the west side, and the scene along these few kilometers also makes up 95 percent of the pictures taken. From East. On the north side of Bagneres-Luchon I spend some time walking through the cemetery and its maze of angel statues stretching up a south facing hill and backgrounded by the far, snowcapped wall of the Pyrenees. From the highest graves you get the best view of Bagneres with the mountains in the background that I have seen. But in the afternoon the light is from the front. I finally extract myself from the garden of heavenly monuments and walk back to the locked bike in order to ride up Col de Peyresroude. The start of this climb has more traffic and less shoulder than I had been spoiled with in recent weeks. The road traverses up a south facing ridge and passes by the villages at a distance, that makes them look panoramic. In order to go through one villages, you turn off at a curious triangular building, that wedges between D618 and the hillside. The image that seems to be most associated with this pass (definitely the most photographed) comes further up. It is the long straight away and following meandering switchbacks on sweeping grass hills. In my memory I would have judged the reach of these back and forth meanders below the summit much larger, than they actually appear on the map. They do tend to stick in my memory larger than they actually are. Across this green bowl lies Portet-de-Luchon, its houses displayed like models in a green porcelain dish. Again the signed main route passes by the village so that it appears to invite to be explored, without actually showing off its workings. A side road leads through the village, and I have been told that this is actually a preferable biking route. Traffic up here above the trees is much lighter and consists largely of cyclists of all types. I even see a few other tourists with heavy saddle bags. In my case the light is pretty hazy here. From West. (described downwards) At the top waits a small transmission facility and I seem to remember a Tour de France sign and a small building. Also - the light conditions improve and suddenly make the far Pic du Midi de Bigorre stand out of the landscape like a crown. An at least equally impressive photograph, but with totally different lighting of the exact same scene is in the slideshow. Immediately after the summit an additional loop can be used to substitute a higher point as summit. for the Col de Peyresroude, This loop leads to a ski area and then rejoins the profile further down. I only ride up the first km and conclude, that from that loop the view onto high peaks is much more expansive. The profile descends below treeline and the peaks to the south seem to grow in stature. A few last verdant pastures make a radiant foreground to big white wedges behind, as I roll into Loudervielle. The now busier road collects a number of small villages before it gets to Arreau. They all have an appealing outside. But none of them have open grocery stores or hotels. Arreau hotels turn out to be also extremely expensive or closed in June, and the Tourist Office personnel seem to take pleasure in telling you this. I actually ride the lower part of the profile several times in order to check this out myself, and finally retreat down the valley in heavier traffic to Sarroncolin, which is not much better. Cycling-Tour de France: Between 1948 and 2016, the Tour de France crossed the pass in a full 45 years. Imagine all the types of bicycles that have crossed this pass. In 2012 it was even climbed twice. One of these times the climb continued to the ski area mentioned above.